Hopping into Spring: an afternoon at the Nicholson’s Spring Ale Festival | It Comes In Pints? Spring is in the air! Somewhere, no doubt, adorable lambs are gamboling through drifts of cherry blossom as fuzzy chicks escape their chocolate eggs and frolic among daffodils. ICIP wouldn’t know, because we live in central London, where the turn of the seasons is celebrated in the time-honoured way… with a seasonal beer festival. Forget daylight savings: here we know that winter is [not] coming because the stouts disappear and you can’t move for wheat beer. Our buddies at Nicholson’s Pubs dropped us a copy of the menu for their Spring Ale Festival (which runs Monday 24th March to Saturday 19th April) so, using the mad skills we honed at Craft Beer Rising, ICIP charted a well-balanced, open-minded course through the ales on offer. And no wonder they’re selling out: you can score money off beer instantly (is there any better sentence in the English language?) by joining Nicholson’s Hop Circle IN THE PUB ITSELF, by scanning one of the many QR codes (those big square barcodes that you wave your phone at like you’re in The Matrix) around the bar. Luckily for us there is plenty left to taste, and we trust Annie to take us off-piste. We start with a glass of Inveralmond‘s Ossian, a delicious, spring-tastic IPA. Rich and full, the well-rounded Fuggles balanced out other hops. The lovely Ossian nearly went down the wrong way, though, when Annie set out some glasses of bright green beer on the bar. 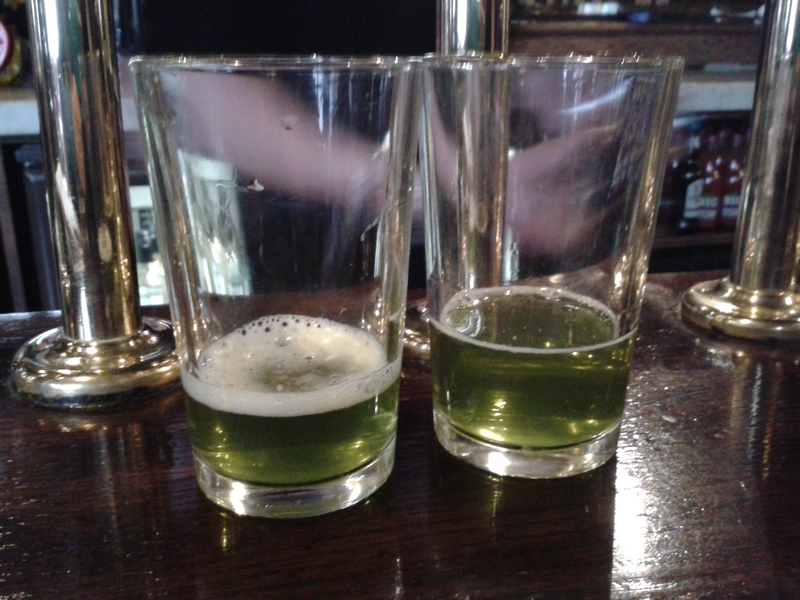 This was our first taste of Stonehenge Ales‘ Sign of Spring, which Annie assured us was naturally green, not some kind of Frankenbeer. Yes, it was very zingy and refreshing, but it was hard to say where the citrus started and the optical I’M DRINKING LIME JUICE illusion ended. In between puzzled sips of green, Annie explained why the festival was going so well. “This year they balanced the menu better,” she says, of Nicholson’s HQ. “They had mild and porters. Collaboration brews are very popular – people know it’s beer they can only get in a Nicholson’s.” Punters are voting for their favourite beers on Twitter throughout the festival, with the winner securing a guest spot at Nicholson’s pubs. 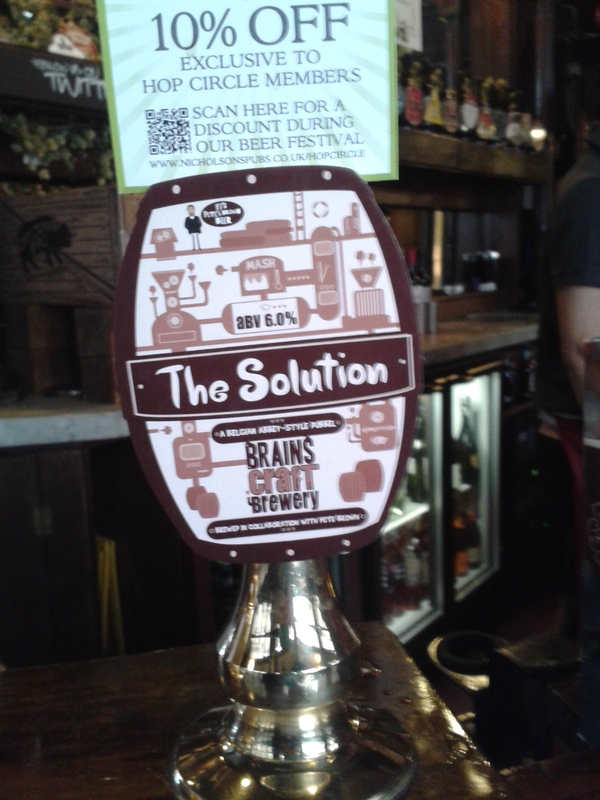 At the moment the Pete Brown and Brains collaboration, The Solution, is in the lead (much to our delight – it was our favourite at the tasting we attended in March). Rich and fruity, it was a pleasure to have the opportunity to drink this again. 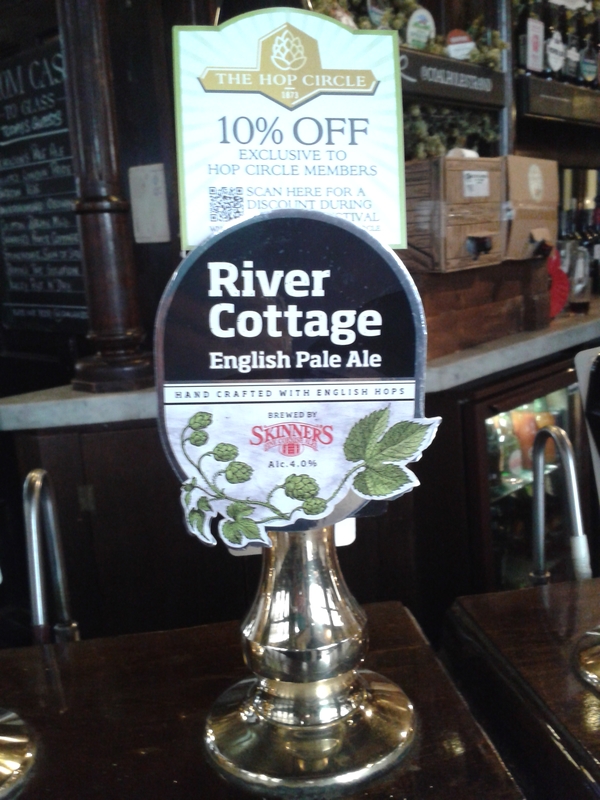 Next we try an offering from the Skinners Brewery – River Cottage EPA, brewed for the home farm of the TV chef Hugh Fearnley-Whittingstall. The beer is, Annie tells us, “typically Cornish”. It’s light, floral and delicate – and we were pleased to taste the UK Cascade hop holding its own. Jarrow Brewery‘s Isis, which we try next, is similar – floral, citrus-y, well balanced beer. It’s sweeter than River Cottage but the hops round this off with a bitter finish. We move on to Ilkley‘s Rye and Dry – a great dessert beer, all caramel, sweet and citrus. Such a dessert beer, in fact, that ICIP’s tasting notes shriek in barely-legible shorthand “WHAT’S THAT FRENCH PUDDING?” A quick Google suggests oranges with caramel, which is exactly what this beer tasted like, but there doesn’t seem to be any evidence it is French, but that doesn’t matter because it’s delicious. We finish with a mouthful of malty, toasty Balmy Mild by Cropton Brewery. 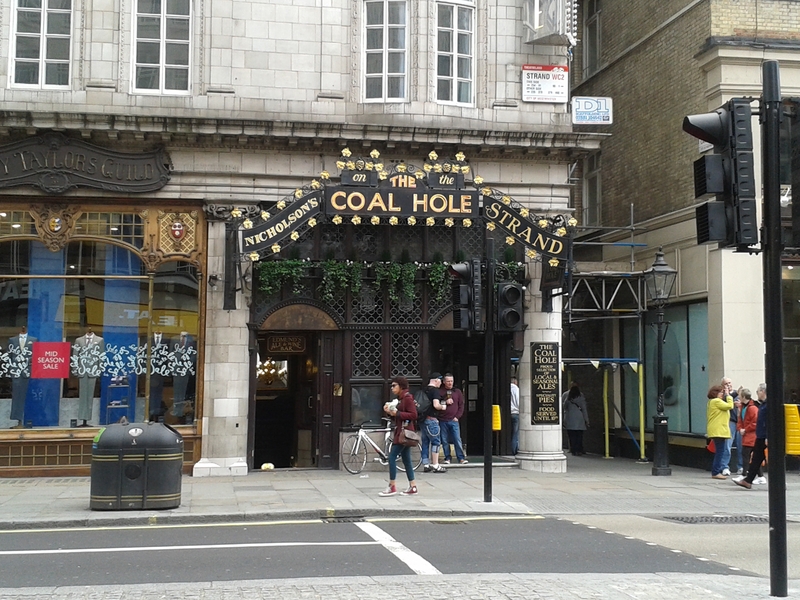 Looking around The Coal Hole – which, early afternoon on a Saturday, overflows with tourists, but on weekdays draws a smart business crowd – we wonder if Nicholson’s is at risk of putting off its regulars by doling out green beer and cherry-flavoured ale. 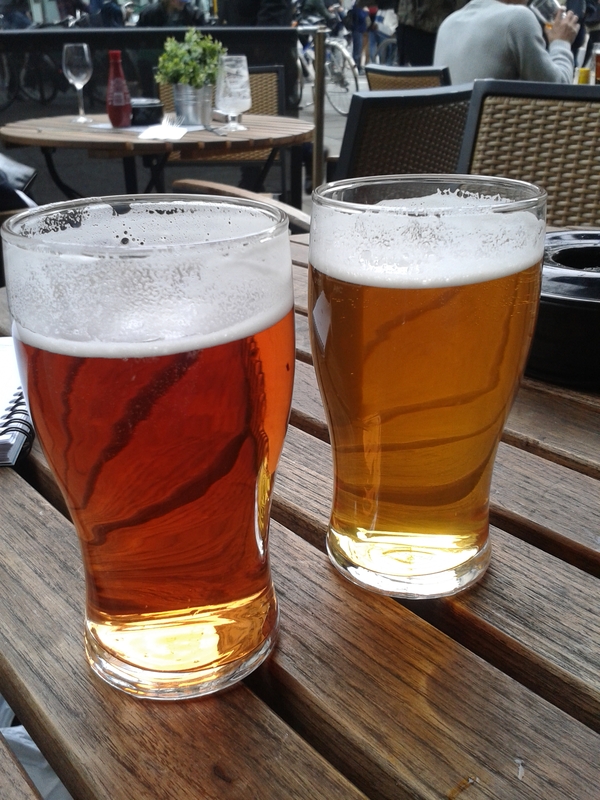 “We keep on the traditional ales like Fuller’s London Pride,” says Annie. “We don’t want to force the ‘Jims’ of this world to change their habits” – she nods towards an older man enjoying a quiet pint at the bar, probably blissfully unaware and unconcerned that a pair of over-excited beer bloggers are INSTAGRAMMINGTWEETINGPINTERESTINGTUMBLERING frenetically around him. “London Pride will continue to sell,” she adds. One trick of the trade, Annie tells us, is effective deployment of sparkler. The sheen and added fizz can give otherwise leftfield brews sudden mass appeal. “You have to gauge the customer,” she tells us. “The sparkler is handy with people from Yorkshire. They’re used to Tetley, for example, and we don’t sell that, but if you offer them a pint of cask ale with a sparkler they find a beer they can drink all weekend.” Ladies, she adds, have proved more daring than the blokes. Women have “a more discerning palate,” she concludes. What, then, is a spring beer? Something with lots of blossom, floral and citrus notes, light and quaffable? “The traditional idea of a spring ale is something that has connotations of pale, blonde, 4%, hoppy, zesty, not too much of anything,” Annie agrees. And yet – Nicholson’s has done a roaring trade in punchy, strong beers, bitter IPAs and, incredibly, porter. “This festival has made a mockery of that!” Annie concludes. Even better, the festival has proved something Annie knew well: that people will travel for a speciality beer. “We should be on that,” she says. “We should always have at least one speciality. This festival proves that that does work.” Beer drinkers in general have become more fluent – Annie tells us that the tasting paddles of three halves have proved very popular. This presents a certain challenge for Nicholson’s, too – pubs try to stock different beers to their neighbours, so that customers ‘doing the rounds’ don’t keep encountering the same beer. “It takes an extra bit of planning,” Annie agrees. It’s time to bring up the “W” word, because it’s impossible to ignore the fact that Nicholson’s major competitor, Wetherspoons, runs their spring festival at exactly the same time. With three collaboration beers brewed with Sixpoint Brewery in Brooklyn, New York, on offer at the cheeky price of c£2.90 a can [check out fellow beer-blogger Nate’s review here], Wetherspoons have upped their game. “I always go and have a nose around,” Annie admits. “They’re getting better – obviously they’ve been taking notes from us! Some of what they were doing at the last one was an abomination. The staff had no clue and they didn’t have enough beer! It left a lot to be desired, but they are getting better. Competition is healthy.” Annie admits she is jealous of the canned Brooklyn collab. “I wish we could do that,” she sighs. But she thinks her prayers have been answered: Nicholson’s are to experiment with stocking some craft beer in bottles – and The Coal Hole is going to be at the forefront of the new initiative. “There’s a market there,” she confirms. But Nicholson’s have little to fear from their competitors. Well-informed staff – of which there are 28 at The Coal Hole, 20 in Front of House – are one of Nicholson’s greatest sells. “I don’t expect them to love every beer; we change so often,” Annie says of the staff who are proficiently getting on with their day around us. “But I want them to know the basics. I’m not pretending they’re ale gurus – my cask master is! – but that is part of their education. A big winner for customers is ‘try before you buy’ – that’s good customer service. We ask: what do you normally drink? Then lead them from there. Some people are a bit cheeky but it still leads to a sale.” Regular readers may remember that ICIP like to close up our trips to Nicholson’s with a rare foray into the world of cider (ICIP admittedly frequently has no memory of this). Annie’s happy to oblige. One cider, Orchard Pig‘s Explorer, has already sold out. But we’re more than happy with a glass of astringent, green apple-y Aspall Cyderkyn and the smoother Orchard Pig Philosopher. ICIP leave Annie to her busy bar and stagger off down The Strand to The Coal Hole’s closest neighbor, The Wellington, to test the Nicholson’s ale diffusion and to decipher our notes before they dissolve completely into irretrievable squiggles and happy ticks. Sure enough, the bar is stocked with beers that weren’t on at The Coal Hole, so we close our day with the Rudgate Brewery Cherry Pale – as you’d expect, a very sweet floral nose, initially very bitter but tapering off to quite a flowery finish – and the light, sharp and grassy St Austell Proper Job. The countryside can keep their lambs and chicks. Cheers. The Nicholson’s Spring Ale Festival will run from Monday 24th March to Saturday 19th April at Nicholson’s Pubs across the country. You can find more information and a copy of the programme on their website. Want more? Check out our coverage of previous Nicholson’s Ale Festivals (Autumn and Winter 2013) and of the beer and food pairing evening showcasing the Brains Brewery collabs which will be available during the festival. This entry was posted in Festivals/Events, Interviews and tagged ale, Beer, beer festival, Nicholson's, nicholson's pubs, real ale, the cole hole on 09/04/2014 by icipints.